One of the joys of creative work, of any kind, is the chance to collaborate. A good collaboration leads to startling results as you are forced to modify and improve your own ideas through the creative filters and work processes of someone else. And on a personal level, a good collaboration is an opportunity to deepen and strengthen a relationship. 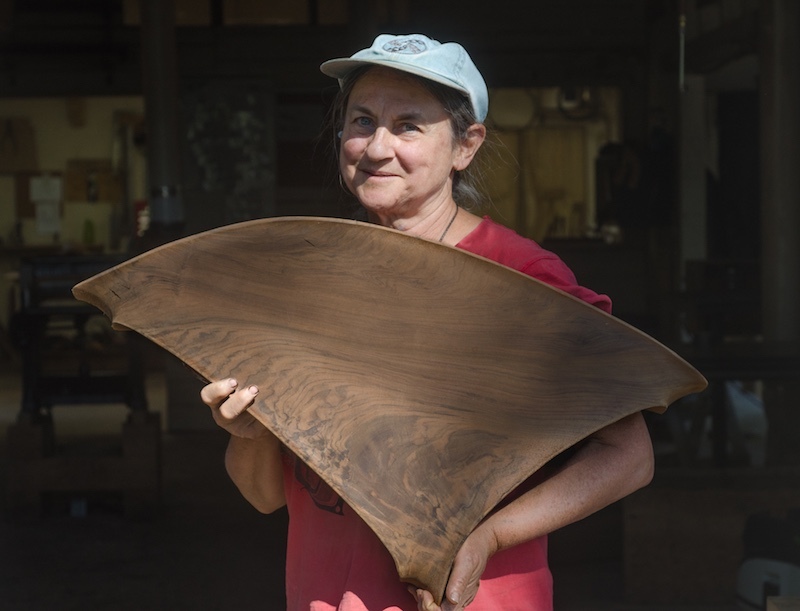 Last November I was lucky enough to accomplish both of these things when we completed a table with our neighbor, land-partner, friend, award winning wood sculptor, and my godmother, Holly Tornheim. Holly and her husband Bruce Boyd were two members of the original team that helped to build poet Gary Snyder’s house, Kitkitdizze, in 1970. That team included my father, and when they completed that project they, along with six other members of the work crew, went on to purchase an adjoining piece of land. They called their new piece of property Wepa (which means “coyote” in the language of the Nisenan, the indigenous Native American tribe), in a nod to the popular idea that Native Americans were exemplars of land stewardship and community-based living. Wepa was to be a communal living experiment, an active rejection of pure capitalism and an embracing of the ideal of intentional community. Wepa is where I grew up, where my dad and Holly both built their woodshops, and where we all continue to work to this day. Perhaps because Wepa was able to strike a balance between the private and public, and between socialism and capitalism, it continues to be one of the most successful approaches to communal living that I’m aware of. The idea to collaborate with Holly came four years ago in the process of putting together a gallery show. My dad and I had two book-matched pieces of figured California walnut and were contemplating building them into a coffee table. 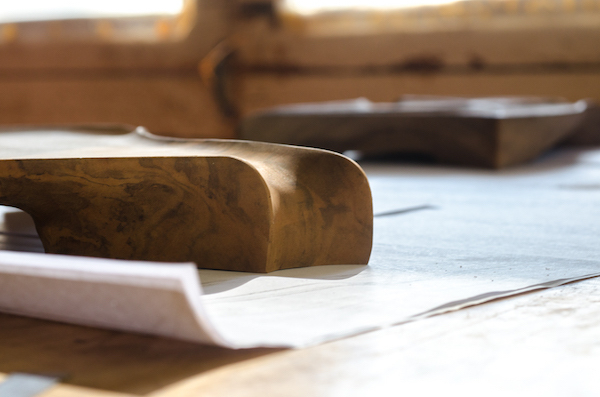 Everything about the pieces called for a sculptural approach—from the heart-shaped grain pattern, to a curved live edge—a sculptural approach that went beyond the functional curves that my dad has incorporated into his designs for the past 45 years. The more I thought about it, the more the pieces of wood reminded me of something that Holly would use in one of her carved pieces of wood art. 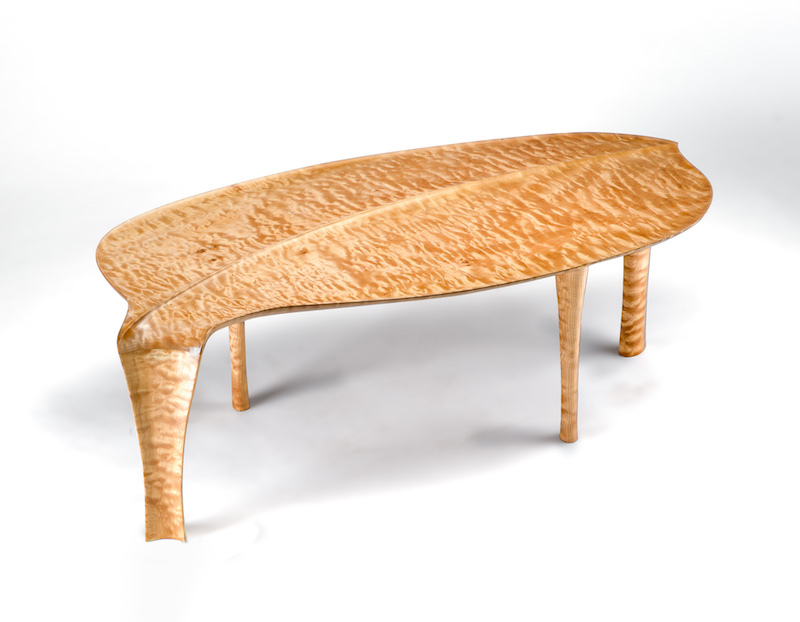 My concept was simple: make the top of the table feel light and organic, like a curling leaf, and then continue that motif uninterrupted down into a main leg. Functionally there would need to be other legs but they would be of lesser visual impact, keeping the design as simple as possible. 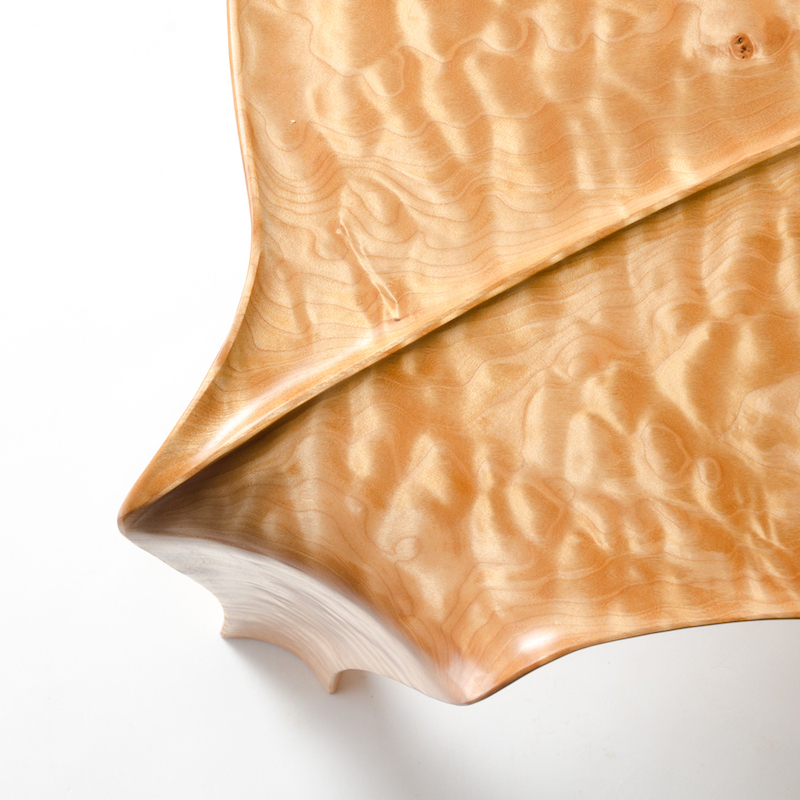 The idea for the curling edges of the top came from a detail that Holly uses extensively in her work. A thin lip, or ridge, like the top of a cresting wave, undulates through many of her pieces, and it imparts an incredible sense of delicacy and craft. I thought we could take this aesthetic detail and make it into a functional detail on a full-sized coffee table: it would serve as a rim to keep items from slipping off the top, and to contain any spills that might occur. I also hoped that we could put it to use to solve a tricky joinery problem we were running into. 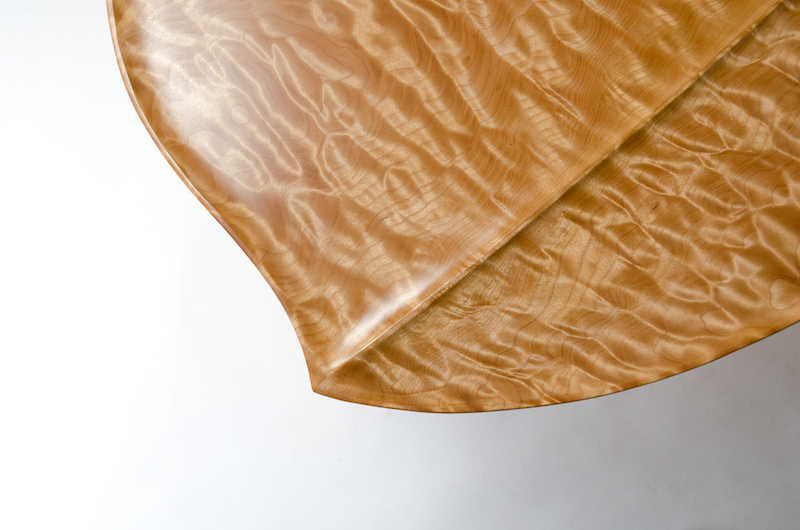 Though I had originally envisioned walnut as the material to use for the table, the piece was going into a room that called for a lighter wood, and the client chose instead of walnut the dramatic and beautiful Pacific quilted maple. The only problem was that we didn’t have any pieces of maple wide enough to make the top out of a single slab. In spite of living next door to each other, and both working in wood, my dad and Holly took very different paths to their craft. My dad built furniture, a process that requires lots of precise joinery of many different pieces of wood. Holly went a different direction (“I gave all that up a long time ago,” she told me, referring to any kind of joining of different pieces of wood together), and focused on carving chunks of solid wood into sculptural bowls and spoons, and then later in her career, moving onto more purely art pieces. Occasionally my dad would enlist Holly to carve a part for one of his pieces, like the curved handles she did for a massive credenza we built in 1990, or the control knobs we put on our office chairs, but they largely pursued their own paths and designs independent of each other. But looking at the two pieces of figured walnut in 2013, I realized there was the possibility for something much more. I envisioned a table put together using our joinery techniques and functional knowledge , but fully carved by Holly. 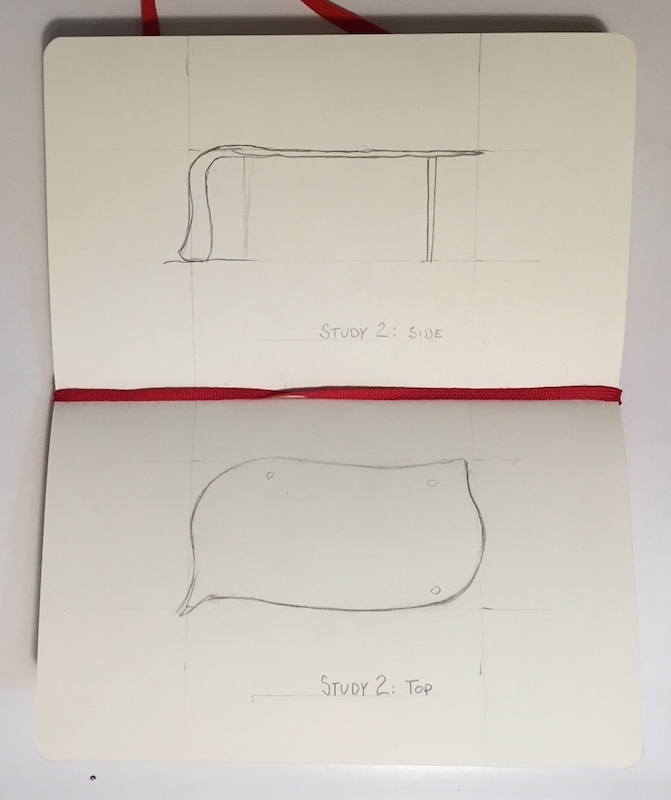 Ultimately, the gallery show we were preparing for didn’t come together, but the idea persisted, and so when we were approached by a return client in 2016 to design and build a coffee table I included as an option a sketch for a table fully carved by Holly. He responded enthusiastically and the decision was made to move forward. Normally, this isn’t a problem. Virtually all dining tables are glued together from multiple pieces of wood, and this is an effect that can be used to dramatic effect, as when we lay up a book-match. But Holly’s style is built around carving from a single piece, and even though it wasn’t going to be possible to do that in this case, I wanted to at least create the convincing illusion of it appearing that way. 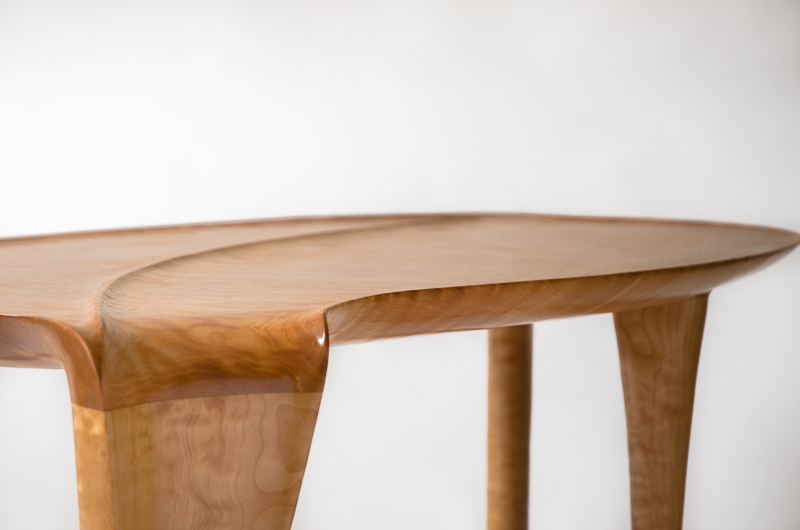 In modern furniture design, derived from Danish cabinetmakers of the early- and mid-20th century, joinery is typically celebrated as a point of detail. But there are cases where you want to hide the joint, and this was one of them. 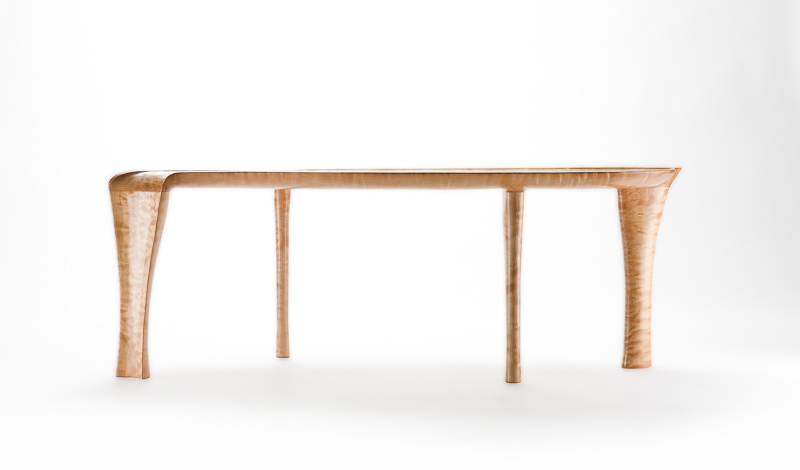 It was problematic however, because in the broad expanse of wood that makes up a tabletop, there’s no place to hide. The answer? Hide it in plain sight. We cut the two pieces of maple we were using for the top into two curved pieces, and then glued them up so that the glue line created an organic, fair curve that split the top in two. 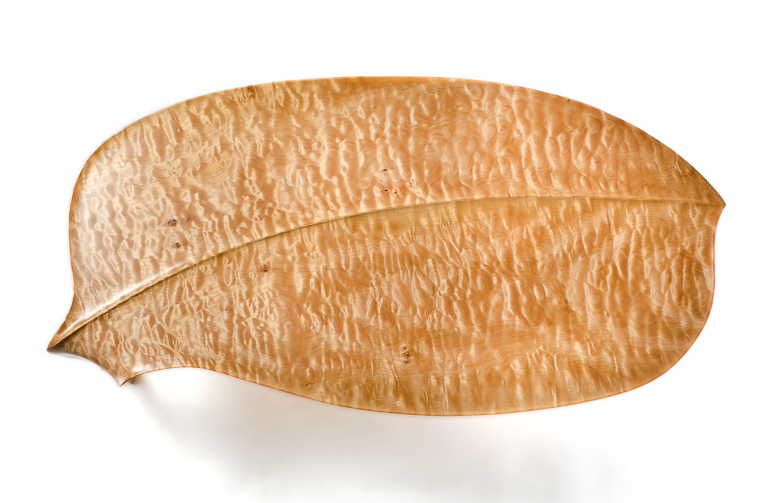 Then, when Holly carved the piece, she used this line as a guide to create one of her signature spines, and the resulting detail was enough to distract the eye away from the shift in wood grain, and create the illusion that the top is made from a single piece. Creating this table with Holly took a lot of back and forth: a lot of sketching, carving, and talking. 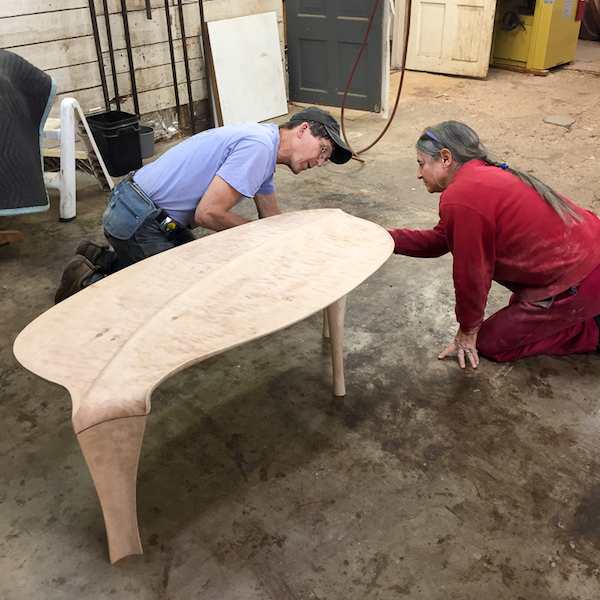 This took place at my workbench and frequently on the shop floor as we drew out ideas full-size and then stood up to contemplate them as though we were looking down on an actual coffee table. Additionally, we frequently needed to check back in with the client, who was extremely supportive of this process, as we made changes and updates to the design. In spite of having known Holly my entire life, this interaction led us to relate in ways we never had before. An artistic process calls for honest criticism and evaluation, and a good collaboration requires you to simultaneously listen closely to someone and push hard for your own ideas when you think you’re right. The result was something we both feel proud of. To learn more about Holly’s work, visit her website here.